In contrast to radiation, cognitive dysfunction related to systemic chemotherapy is not as well understood. The purpose of this article is to specifically discuss “chemobrain” by describing the scope of the problem, outlining possible mechanisms by which chemotherapy may impair brain function, and addressing the methods used to evaluate and treat cognitive problems. WHAT IS THE EVIDENCE SEEN IN PATIENTS? These two studies were analyzed along with others in a soon-to-be published meta-analysis conducted in Australia.10 The investigators in this study assessed the severity and nature of cognitive impairment and then identified several important patterns helpful in understanding this problem. Encouragingly, they found that cognitive impairment does diminish over time; most severe cognitive side effects of chemotherapy diminish within two years. Additionally, the Australian researchers found that the use of tamoxifen along with chemotherapy sharply exacerbates its cognitive side effects. It is not yet known whether the newer aromatase inhibitor drug anastrazole (Arimidex) has the same detrimental cognitive effects. Finally, the authors of this meta-analysis found that the cognitive side effects of chemotherapy are more severe in younger women. Evidence for physical damage to the brain has been seen in studies of chemotherapy-treated cancer survivors that were compared to healthy controls.11, 12 Using magnetic resonance imaging (MRI), investigators discovered reductions in grey and white matter that were widely distributed throughout the brain. Evidence for neurophysiologic damage has been similarly provided in a study of breast cancer patients treated with chemotherapy.14 Patients were monitored with standard electroencephalogram (EEG) and tested with visual skills tasks. Compared to controls, patients who had received chemotherapy performed slower on visual tasks and had demonstrable EEG differences. Psychological factors may exacerbate the cognitive side effects of chemotherapy. Potentially relevant are depression, fatigue, the stress of diagnosis,17, 18 anxiety about the possibility of disease recurrence,19, 20 and hormonal treatment.16 In the Winter 2004 issue of Avenues, we reported on the relationship between stress, serum cortisol, social support, and quality of life. These factors may play a role in the cognitive side effects of chemotherapy; stress is likely to increase these side effects and having good social support is likely to decrease them. Chemotherapy is known to damage the inner lining of blood vessels, which can lead to increased clotting of blood and possible micro-strokes in the central nervous system.23 Furthermore, this damage to the vessels could lead to increased production of interleukins (compounds produced by cells of the immune system that function in the regulation of the immune system), further accentuating the changes in cognitive function. HOW CAN CHEMOBRAIN BE TREATED? Donepezil (Aricept) has been shown to improve cognitive function in people who have mild to moderate Alzheimer’s disease and may be beneficial in the treatment of chemobrain.31 Also promising, the medication naltrexone has shown some evidence in animal studies for treating cognitive side effects of interferon treatment,32 but has not yet been tested with chemotherapy drugs for its potential to reduce adverse cognitive effects. Methylphenidate (Ritalin) can improve behavioral function in patients with malignant glioma brain tumors40 and cognitive function in survivors of childhood cancers.41 A trial of Ritalin in 170 women receiving chemotherapy for breast cancer is currently underway at the University of Toronto. » A well-designed study should quantify the amount of cognitive decline with measurements made before and after chemotherapy. However, problems occur in measuring baseline brain function; for most people, a cancer diagnosis is a time of significant stress, which can itself impair concentration and memory. » A change may be statistically significant, but not clinically meaningful. What is clinically meaningful in measuring cognitive decline, however, has not yet been defined. Furthermore, questionnaires and tests used to measure cognitive function have not yet been designed that would be valid in different cultural settings. » While a patient may measure within normal limits on a test of cognitive function, it may still be below what is their own acceptable norm. » Problems with memory and concentration are often most obvious when people return to daily life at work and home. Most neurological tests currently in use are conducted in the medical office or research setting, away from “real life” context and demands. One good example is the Functional Assessment of Cancer Therapy-Cognitive (FACT-Cog), a simple self-reported questionnaire developed in consultation with cancer patients and medical practitioners. It is encouraging that researchers have focused on this important problem. Although only limited evidence is available, there are several promising approaches that may satisfy the conservative principle of “it could help, probably won’t hurt”: (1) if anticipating chemotherapy treatment, do what you can prior to beginning treatment to improve your physical stamina through exercise, (2) do your best to maintain physical exercise during chemotherapy treatment, (3) ask your doctor about the advisability and safety of combining Ritalin and/or aspirin with your chemotherapy treatment, (4) minimize your stress levels and practice techniques that cultivate relaxation, and (5) ask your doctor what vitamins and antioxidants can be safely used between cycles of chemotherapy. The following two articles can provide an intelligent forum for initiating discussion with your oncologist about the use of antioxidants along with chemotherapy. Lamson, D W and M S Brignall (1999). “Antioxidants in cancer therapy: their actions and interactions with oncologic therapies.” Alternative Medicine Review 4(5): 304-329. Lamson, D W and M S Brignall (2000). “Antioxidants and cancer therapy II: quick reference guide.”Alternative Medicine Review 5(2): 152-63. 1. Tannock IF, Ahles TA, Ganz PA, Van Dam FS. Cognitive impairment associated with chemotherapy for cancer: report of a workshop. J Clin Oncol. Jun 1 2004;22(11):2233-2239. 2. Galantino ML, Henderson A, Michaels J. Cognitive Challenges for Women Undergoing Adjuvant Chemotherapy for Treatment for Breast Cancer: The Role of Rehabilitation Oncology. Rehabilitation Oncology. 2005;23(1):7. 3. Barton D, Loprinzi C. Novel approaches to preventing chemotherapy-induced cognitive dysfunction in breast cancer: the art of the possible. Clin Breast Cancer. Dec 2002;3 Suppl 3:S121-127. 4. Ahles TA, Silberfarb PM, Herndon J, 2nd, et al. Psychologic and neuropsychologic functioning of patients with limited small-cell lung cancer treated with chemotherapy and radiation therapy with or without warfarin: a study by the Cancer and Leukemia Group B. J Clin Oncol. May 1998;16(5):1954-1960. 5. Hulshof MC, Stark NM, van der Kleij A, Sminia P, Smeding HM, Gonzalez Gonzalez D. Hyperbaric oxygen therapy for cognitive disorders after irradiation of the brain. Strahlenther Onkol. Apr 2002;178(4):192-198. 6. Mayer R, Hamilton-Farrell MR, van der Kleij AJ, et al. Hyperbaric oxygen and radiotherapy. Strahlenther Onkol. Feb 2005;181(2):113-123. 7. Rugo HS, Ahles T. The impact of adjuvant therapy for breast cancer on cognitive function: current evidence and directions for research. Semin Oncol. Dec 2003;30(6):749-762. 8. Schagen SB, van Dam FS, Muller MJ, Boogerd W, Lindeboom J, Bruning PF. Cognitive deficits after postoperative adjuvant chemotherapy for breast carcinoma. Cancer. Feb 1 1999;85(3):640-650. 9. Brezden CB, Phillips KA, Abdolell M, Bunston T, Tannock IF. Cognitive function in breast cancer patients receiving adjuvant chemotherapy. J Clin Oncol. Jul 2000;18(14):2695-2701. 10. Falleti MG, Sanfilippo A, Maruff P, Weih L, Phillips KA. The nature and severity of cognitive impairment associated with adjuvant chemotherapy in women with breast cancer: A meta-analysis of the current literature. Brain Cogn. Jun 20 2005. 11. Saykin AJ, Ahles TA, McDonald BC. Mechanisms of chemotherapy-induced cognitive disorders: neuropsychological, pathophysiological, and neuroimaging perspectives. Semin Clin Neuropsychiatry. Oct 2003;8(4):201-216. 12. Saykin AJ, Ahles TA, Schoenfeld JD. Grey matter reduction on voxel-based morphometry in chemotherapy-treated cancer survivors. J Int Neuropsychol Soc. 2003;9:246. 13. Silverman DH, Castellon SA, Abraham L. Abnormal regional brain metabolism in breast cancer survivors after adjuvant chemotherapy is associated with cognitive changes. Proc Am Soc Clin Oncol. 2003 (abstr 47);22:12. 14. Schagen SB, Hamburger HL, Muller MJ. Neuropsychological evaluation of late effects of adjuvant high-dose chemotherapy on cognitive function. J Neurooncol. 2001;51:159-165. 15. Goodwin PJ, Ennis M, Pritchard KI, Trudeau M, Hood N. Risk of menopause during the first year after breast cancer diagnosis. J Clin Oncol. Aug 1999;17(8):2365-2370. 16. Bender CM, Paraska KK, Sereika SM, Ryan CM, Berga SL. Cognitive Function and Reproductive Hormones in Adjuvant Therapy for Breast Cancer: A Critical Review. Journal of Pain and Symptom Management. May 2001;21(5):407-424. 17. Cimprich B, Ronis DL. Attention and symptom distress in women with and without breast cancer. Nurs Res. Mar-Apr 2001;50(2):86-94. 18. Cimprich B. Pretreatment symptom distress in women newly diagnosed with breast cancer. Cancer Nurs. Jun 1999;22(3):185-194; quiz 195. 19. Lee-Jones C, Humphris G, Dixon R, Hatcher MB. Fear of cancer recurrence–a literature review and proposed cognitive formulation to explain exacerbation of recurrence fears. Psychooncology. Jun 1997;6(2):95-105. 20. Bower JE, Ganz PA, Desmond KA, Rowland JH, Meyerowitz BE, Belin TR. Fatigue in breast cancer survivors: occurrence, correlates, and impact on quality of life. J Clin Oncol. Feb 2000;18(4):743-753. 21. Bennett DA, Wilson RS, Schneider JA, et al. Apolipoprotein E epsilon4 allele, AD pathology, and the clinical expression of Alzheimer’s disease. Neurology. Jan 28 2003;60(2):246-252. 22. Ahles TA, Saykin AJ, Noll WW, et al. The relationship of APOE genotype to neuropsychological performance in long-term cancer survivors treated with standard dose chemotherapy. Psychooncology. Sep 2003;12(6):612-619. 23. Levine MN, Gent M, Hirsh J, et al. The thrombogenic effect of anticancer drug therapy in women with stage II breast cancer. N Engl J Med. Feb 18 1988;318(7):404-407. 24. Schulz KH, Heesen C. [Effects of exercise in chronically ill patients. Examples from oncology and neurology]. Bundesgesundheitsblatt Gesundheitsforschung Gesundheitsschutz. Aug 2005;48(8):906-913. 25. Dimeo FC, Thomas F, Raabe-Menssen C, Propper F, Mathias M. Effect of aerobic exercise and relaxation training on fatigue and physical performance of cancer patients after surgery. A randomised controlled trial. Support Care Cancer. Nov 2004;12(11):774-779. 26. Hartmann U, Ring C, Reuss-Borst MA. [Improvement of health-related quality of life in breast cancer patients by inpatient rehabilitation]. Med Klin (Munich). Aug 15 2004;99(8):422-429. 27. Lesage P, Portenoy RK. Management of fatigue in the cancer patient. Oncology (Williston Park). Mar 2002;16(3):373-378, 381; discussion 381-372, 385-376, 388-379. 28. Ott CD, Lindsey AM, Waltman NL, et al. Facilitative strategies, psychological factors, and strength/weight training behaviors in breast cancer survivors who are at risk for osteoporosis. Orthop Nurs. Jan-Feb 2004;23(1):45-52. 29. Fialka-Moser V, Crevenna R, Korpan M, Quittan M. Cancer rehabilitation: particularly with aspects on physical impairments. J Rehabil Med. Jul 2003;35(4):153-162. 30. Hwang SL, Lee KS, Lin CL, et al. Effect of aspirin and indomethacin on prostaglandin E2 synthesis in C6 glioma cells. Kaohsiung J Med Sci. Jan 2004;20(1):1-5. 31. Rogers SL, Farlow MR, Doody RS, Mohs R, Friedhoff LT. A 24-week, double-blind, placebo-controlled trial of donepezil in patients with Alzheimer’s disease. Donepezil Study Group. Neurology. Jan 1998;50(1):136-145. 32. Valentine AD, Meyers CA, Talpaz M. Treatment of neurotoxic side effects of interferon-alpha with naltrexone. Cancer Invest. 1995;13(6):561-566. 33. Masuda S, Okano M, Yamagishi K, Nagao M, Ueda M, Sasaki R. A novel site of erythropoietin production. Oxygen-dependent production in cultured rat astrocytes. J Biol Chem. Jul 29 1994;269(30):19488-19493. 34. Ehrenreich H, Hasselblatt M, Dembowski C, et al. Erythropoietin therapy for acute stroke is both safe and beneficial. Mol Med. Aug 2002;8(8):495-505. 35. O’Shaughnessy JA. Effects of epoetin alfa on cognitive function, mood, asthenia, and quality of life in women with breast cancer undergoing adjuvant chemotherapy. Clin Breast Cancer. Dec 2002;3 Suppl 3:S116-120. 36. Leyland-Jones B. Breast cancer trial with erythropoietin terminated unexpectedly. Lancet Oncol. Aug 2003;4(8):459-460. 37. Henke M, Laszig R, Rube C, et al. Erythropoietin to treat head and neck cancer patients with anaemia undergoing radiotherapy: randomised, double-blind, placebo-controlled trial. Lancet. Oct 18 2003;362(9392):1255-1260. 38. Arcasoy MO, Amin K, Karayal AF, et al. Functional significance of erythropoietin receptor expression in breast cancer. Lab Invest. Jul 2002;82(7):911-918. 39. Yasuda Y, Fujita Y, Matsuo T, et al. Erythropoietin regulates tumour growth of human malignancies. Carcinogenesis. Jun 2003;24(6):1021-1029. 40. Meyers CA, Weitzner MA, Valentine AD, Levin VA. Methylphenidate therapy improves cognition, mood, and function of brain tumor patients. J Clin Oncol. Jul 1998;16(7):2522-2527. 41. Thompson SJ, Leigh L, Christensen R, et al. Immediate neurocognitive effects of methylphenidate on learning-impaired survivors of childhood cancer. J Clin Oncol. Mar 15 2001;19(6):1802-1808. 42. Lamson DW, Brignall MS. Antioxidants and cancer therapy II: quick reference guide. Altern Med Rev. Apr 2000;5(2):152-163. 43. Lamson DW, Brignall MS. Antioxidants in cancer therapy; their actions and interactions with oncologic therapies. Alternative Medicine Review. 1999;4(5):304-329. 44. Tobey RA, Tesmer JG. Differential response of cultured human normal and tumor cells to trace element-induced resistance to the alkylating agent melphalan. Cancer Res. Jun 1985;45(6):2567-2571. 45. Takimoto M, Sakurai T, Kodama K, et al. [Protective effect of CoQ 10 administration on cardial toxicity in FAC therapy]. Gan To Kagaku Ryoho. Jan 1982;9(1):116-121. 46. Musatov SA, Rosenfeld SV, Togo EF, Mikheev VS, Anisimov VN. [The influence of melatonin on mutagenicity and antitumor action of cytostatic drugs in mice]. Vopr Onkol. 1997;43(6):623-627. 47. Slavik M, Saiers JH. Phase I clinical study of acetylcysteine’s preventing ifosfamide-induced hematuria. Semin Oncol. Mar 1983;10(1 Suppl 1):62-65. 48. Holoye PY, Duelge J, Hansen RM, Ritch PS, Anderson T. Prophylaxis of ifosfamide toxicity with oral acetylcysteine. Semin Oncol. Mar 1983;10(1 Suppl 1):66-71. 49. Di Re F, Bohm S, Oriana S, et al. High-dose cisplatin and cyclophosphamide with glutathione in the treatment of advanced ovarian cancer. Ann Oncol. Jan 1993;4(1):55-61. 50. Locatelli MC, D’Antona A, Labianca R, et al. A phase II study of combination chemotherapy in advanced ovarian carcinoma with cisplatin and cyclophosphamide plus reduced glutathione as potential protective agent against cisplatin toxicity. Tumori. Feb 28 1993;79(1):37-39. 51. Thatcher N, Blackledge G, Crowther D. Advanced recurrent squamous cell carcinoma of the head and neck. Results of a chemotherapeutic regimen with adriamycin, bleomycin, 5-fluorouracil, methotrextate, and vitamin A. Cancer. Sep 15 1980;46(6):1324-1328. 52. Kurbacher CM, Wagner U, Kolster B, Andreotti PE, Krebs D, Bruckner HW. Ascorbic acid (vitamin C) improves the antineoplastic activity of doxorubicin, cisplatin, and paclitaxel in human breast carcinoma cells in vitro. Cancer Lett. Jun 5 1996;103(2):183-189. 53. Boucher F, Coudray C, Tirard V, et al. Oral selenium supplementation in rats reduces cardiac toxicity of adriamycin during ischemia and reperfusion. Nutrition. Sep-Oct 1995;11(5 Suppl):708-711. 54. Coudray C, Hida H, Boucher F, De Leiris J, Favier A. Modulation by selenium supplementation of lipid peroxidation induced by chronic administration of adriamycin in rats. Nutrition. Sep-Oct 1995;11(5 Suppl):512-516. 55. Cortes EP, Gupta M, Chou C, Amin VC, Folkers K. Adriamycin cardiotoxicity: early detection by systolic time interval and possible prevention by coenzyme Q10. Cancer Treat Rep. Jun 1978;62(6):887-891. 56. Iarussi D, Auricchio U, Agretto A, et al. Protective effect of coenzyme Q10 on anthracyclines cardiotoxicity: control study in children with acute lymphoblastic leukemia and non-Hodgkin lymphoma. Mol Aspects Med. 1994;15 Suppl:s207-212. 57. Okuma K, Furuta I, Ota K. [Protective effect of coenzyme Q10 in cardiotoxicity induced by adriamycin]. Gan To Kagaku Ryoho. Mar 1984;11(3):502-508. 58. Shaeffer J, El-Mahdi AM, Nichols RK. Coenzyme Q10 and adriamycin toxicity in mice. Res Commun Chem Pathol Pharmacol. Aug 1980;29(2):309-315. 59. Lissoni P, Tancini G, Paolorossi F, et al. Chemoneuroendocrine therapy of metastatic breast cancer with persistent thrombocytopenia with weekly low-dose epirubicin plus melatonin: a phase II study. J Pineal Res. Apr 1999;26(3):169-173. 60. Olson RD, Stroo WE, Boerth RC. Influence of N-acetylcysteine on the antitumor activity of doxorubicin. Semin Oncol. Mar 1983;10(1 Suppl 1):29-34. 61. Nagai Y, Horie T, Awazu S. Vitamin A, a useful biochemical modulator capable of preventing intestinal damage during methotrexate treatment. Pharmacol Toxicol. Aug 1993;73(2):69-74. 62. Danysz A, Wierzba K, Pniewska A. The effect of sulfhydryl compounds on 5-fluorouracil toxicity and distribution. Arch Immunol Ther Exp. 1983;31:373-379. 63. Danysz A, Wierzba K, Wutkiewicz M. Influence of some sulfhydryl compounds on the antineoplastic effectiveness of 5-fluorouracil and 6-mercaptopurine. Arch Immunol Ther Exp. 1984;32:345-349. 64. Naganuma A, Satoh M, Imura N. Effect of selenite on renal toxicity and antitumor activity of cis-diamminedichloroplatinum in mice inoculated with Ehrlich ascites tumor cell. J Pharmacobiodyn. Mar 1984;7(3):217-220. 65. Berry JP, Pauwells C, Tlouzeau S, Lespinats G. Effect of selenium in combination with cis-diamminedichloroplatinum(II) in the treatment of murine fibrosarcoma. Cancer Res. Jul 1984;44(7):2864-2868. 66. Ohkawa K, Tsukada Y, Dohzono H, Koike K, Terashima Y. The effects of co-administration of selenium and cis-platin (CDDP) on CDDP-induced toxicity and antitumour activity. Br J Cancer. Jul 1988;58(1):38-41. 67. Hu YJ, Chen Y, Zhang YQ, et al. The protective role of selenium on the toxicity of cisplatin-contained chemotherapy regimen in cancer patients. Biol Trace Elem Res. Mar 1997;56(3):331-341. 68. Lissoni P, Paolorossi F, Ardizzoia A, et al. A randomized study of chemotherapy with cisplatin plus etoposide versus chemoendocrine therapy with cisplatin, etoposide and the pineal hormone melatonin as a first-line treatment of advanced non-small cell lung cancer patients in a poor clinical state. J Pineal Res. Aug 1997;23(1):15-19. 69. Ghielmini M, Pagani O, de Jong J, et al. Double-blind randomized study on the myeloprotective effect of melatonin in combination with carboplatin and etoposide in advanced lung cancer. Br J Cancer. Jun 1999;80(7):1058-1061. 70. Roller A, Weller M. Antioxidants specifically inhibit cisplatin cytotoxicity of human malignant glioma cells. Anticancer Res. Nov-Dec 1998;18(6A):4493-4497. 71. Miyajima A, Nakashima J, Tachibana M, Nakamura K, Hayakawa M, Murai M. N-acetylcysteine modifies cis-dichlorodiammineplatinum-induced effects in bladder cancer cells. Jpn J Cancer Res. May 1999;90(5):565-570. 72. Oxman TE, Schnurr PP, Silberfarb PM. 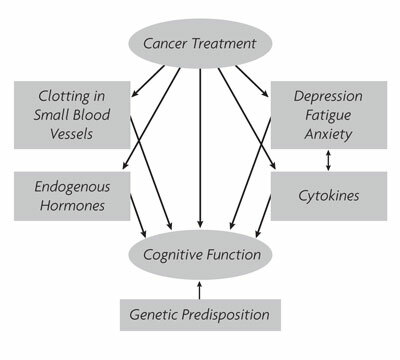 Assessment of cognitive function in cancer patients. Hosp J. 1986;2(3):99-128. 73. Sohlberg MM, Mateer CA. Effectiveness of an attention-training program. J Clin Exp Neuropsychol. Apr 1987;9(2):117-130. 74. Ferguson RJ, Ahles TA. Low neuropsychologic performance among adult cancer survivors treated with chemotherapy. Curr Neurol Neurosci Rep. May 2003;3(3):215-222. 75. Walters SJ, Brazier JE. Comparison of the minimally important difference for two health state utility measures: EQ-5D and SF-6D. Qual Life Res. Aug 2005;14(6):1523-1532. 76. Wagner LI, Sweet J, Cella D. Chemotherapy-related cognitive deficits: A qualitative examination of patients and providers. Ann Behav Med. 2003;25(S056). This entry was posted on Wednesday, December 21st, 2005 at 12:00 pm. It is filed under Avenues, Becoming Your Own Advocate and tagged with Becoming Your Own Advocate, Cognitive Decline.